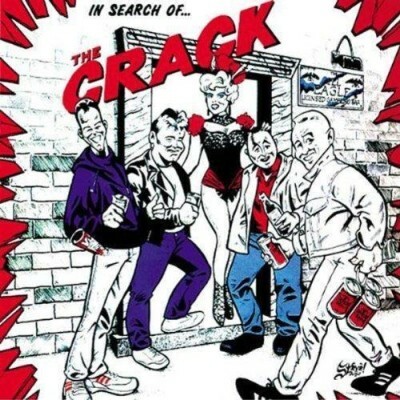 Founded in 1982, The Crack didn't release their debut album until 1989. These British punkers were often tied into the Oi! scene of the mid-80s along with Cockney Rejects, and The Business, they had more in common with the melodic punk stylings of 999 and mod groups like The Jam or Secret Affair. Featuring a blistering wall of guitars and biting melodies, from the classic album opener My World to the raw closer The Giddy House The Crack deliver ten fantastic original tunes that, while firmly rooted in 1980s UK anthemic punk, also features a pop sensibility that presages the oncoming Brit-pop scene that would absolutely dominate the '90s. Seriously, we'd bet the farm that the young Gallagher brothers were blasting this back in 1989. Absolutely essential 1980s UK punk that bridges the gap between 80s OI! and the Brit-pop / power-pop revival. Killer.